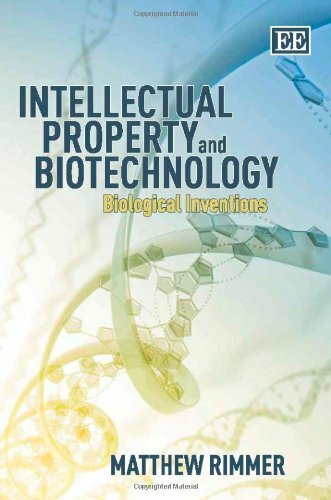 Synopsis: This book documents and evaluates the dramatic expansion of intellectual property law to accommodate various forms of biotechnology from micro-organisms, plants, and animals to human genes and stem cells. It makes a unique theoretical contribution to the controversial public debate over the commercialisation of biological inventions. The author also considers the contradictions between the Supreme Court of Canada rulings in respect of the Harvard Oncomouse, and genetically modified canola.He explores law, policy, and practice in both Australia and New Zealand in respect to gene patents and non-coding DNA. This study charts the rebellion against the European Union Biotechnology Directive - particularly in respect of Myriad Genetics' BRCA1 and BRCA2 patents, and stem cell patent applications. The book also considers whether patent law will accommodate frontier technologies - such as bioinformatics, haplotype mapping, proteomics, pharmacogenomics, and nanotechnology. "Intellectual Property and Biotechnology" will be of prime interest to lawyers and patent attorneys, scientists and researchers, business managers and technology transfer specialists.